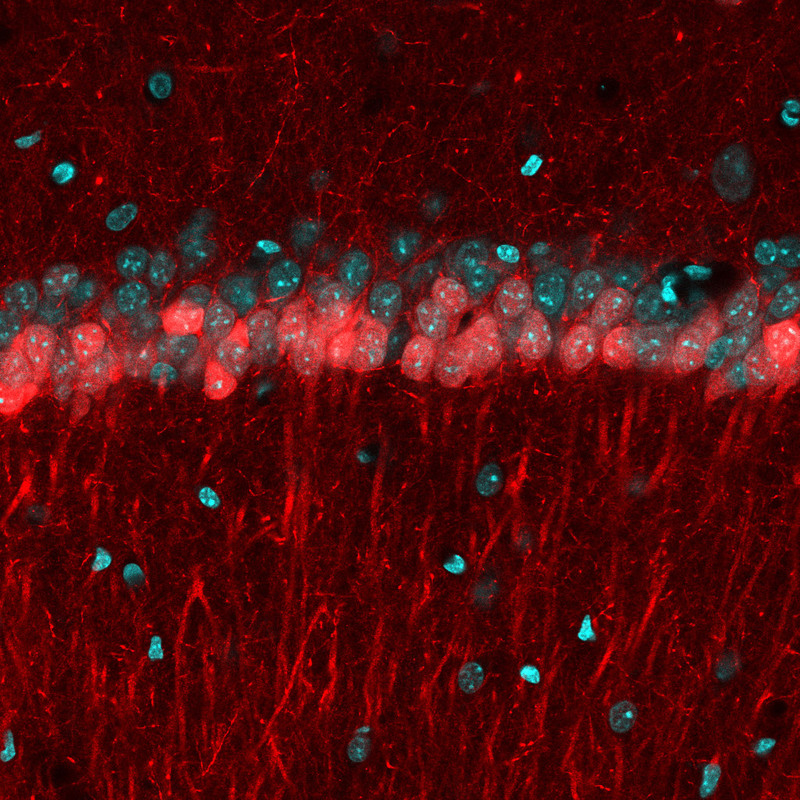 Microscopic image of cells in the CA1 region of the hippocampus, divided into two sublayers. Cells in the superficial layer are stained red, while cells in the deep sublayer are stained in cyan (greenish-blue). (Credit: Nathan Danielson/Losonczy Lab/Columbia's Zuckerman Institute). Columbia scientists have uncovered a key feature of the brain’s GPS that helps a mouse find what it is seeking. The study enabled scientists to define the precise duties of cells in a particular region of the hippocampus, the brain’s learning and memory center. The research also advances a long-standing quest in the field of neuroscience: tracing the pathway that information takes while traveling through the brain. The authors announced these findings today in the journal Neuron. It’s astounding that the ability to navigate to a desired location, an enormously complex feat, can be represented so precisely in the structure of the hippocampus. The hippocampus can be divided into distinct areas that form an interconnected circuit through which memory-related information is processed. 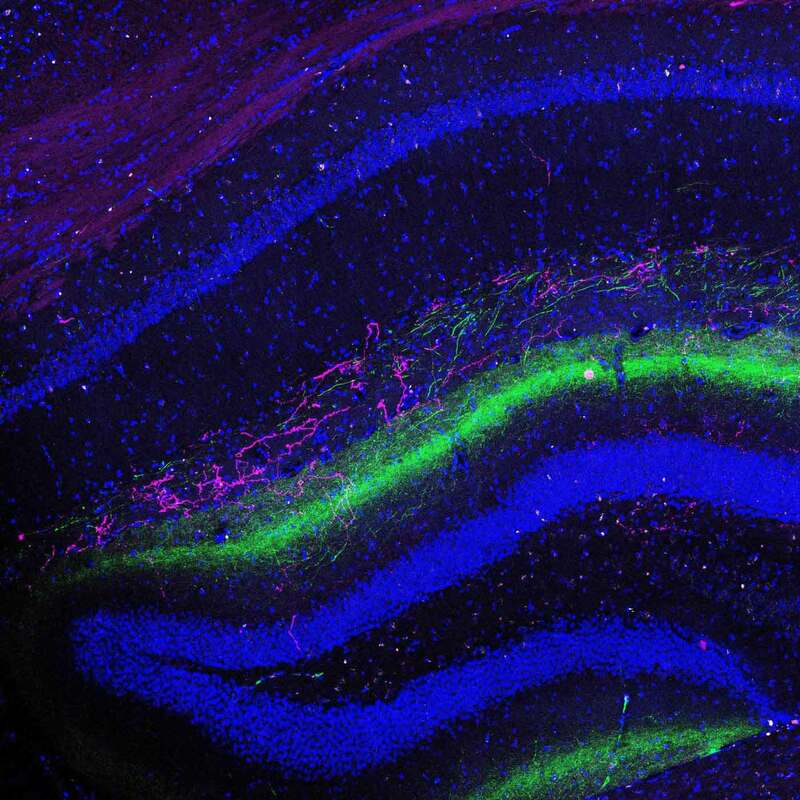 For this study, Dr. Losonczy and his team focused on the hippocampus’ main output node, area CA1, which was discovered by scientists to encode one’s location — work that was awarded the 2014 Nobel Prize. 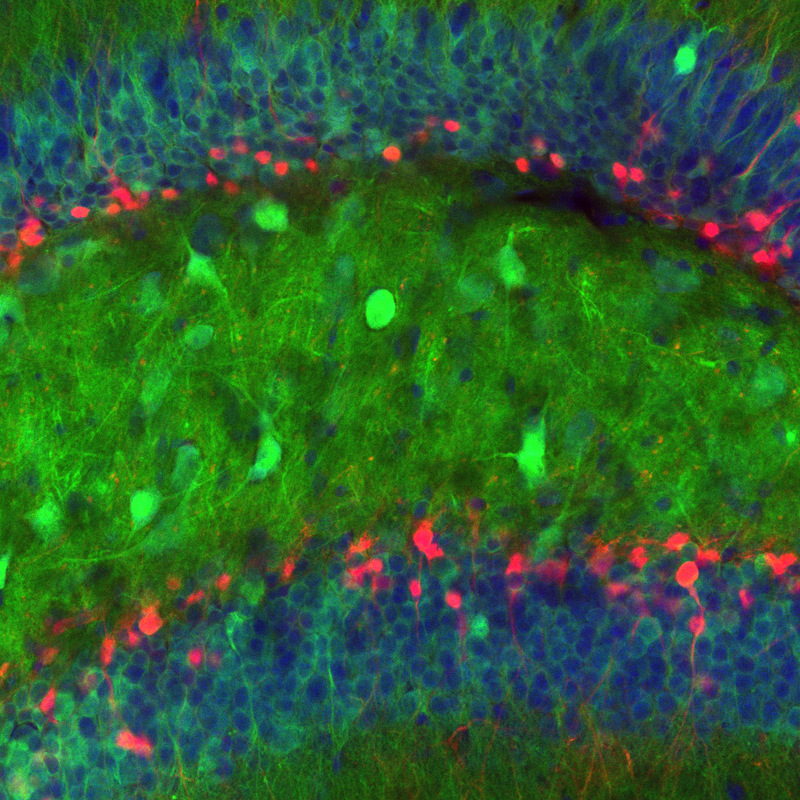 Above: Microscopic image of cells in the CA1 region of the hippocampus, divided into two sublayers. Cells in the superficial layer are stained red, while cells in the deep sublayer are stained in cyan (greenish-blue)(Credit: Nathan Danielson/Columbia's Zuckerman Institute). In the first, mice ran on a treadmill while experiencing different sights and sounds, some familiar and others new. In the second, mice were given the task of finding a water reward placed at a specific, unmarked location along the treadmill. The team repeated these experiments over the course of several sessions and monitored how each of the sublayers responded to the different types of learning. During the second task, however, when the mice needed to learn the location of the hidden reward, the maps in the deep sublayer were significantly more stable, and less dynamic, than in the first task. The scientists also found that deep-sublayer activity was closely linked to the animal’s ability to find the reward. This distinction between the sublayers, the authors argue, could signify two different processes important for navigation. This paper is titled: “Sublayer-specific coding dynamics during spatial navigation and learning in hippocampal area CA1.” Additional contributors include Jeffrey Zaremba, Patrick Kaifosh, PhD, John Bowler and Max Ladow. This research was supported by the National Institute of Neurological Disorders and Stroke (F30NS090819), the National Institute of Mental Health (91F31MH105169, 1R01MH100631, 1U01NS090583, 1R01NS094668), the Howard Hughes Medical Institute, the Searle Scholars Program, the Human Frontier Science Program and the McKnight Foundation. Can Science Explain What Art is For?